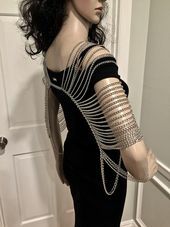 I designed and entirely handmade this unique, elegant, and eye-catching arm accessory. Made of metal, bronze color chains. The main charm color is turquoise and bronze. Length of the main chain around the upper arm: between 9" and 14". If you need it extended, please contact me to adjust it to your arm size.